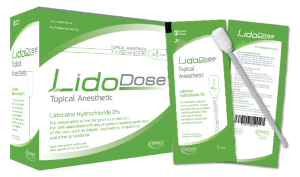 LidoDose®, is a topical anesthetic in a single-use foam applicator. Formulated and manufactured by Gensco in a FDA licensed facility, LidoDose® contains 3% lidocaine hydrochloride (30mg of lidocaine HCl in each gram of gel) in a patented transdermal delivery system. The transdermal delivery system enhances the absorption of the lidocaine across the skin barrier yielding a much greater effect (topical anesthesia) than other prescription formulations including those containing 5% Lidocaine as clinically proven by the Activation Study. Temporary relief of minor pain. LidoDose® is an effective topical anesthetic for preparation of the skin prior to an injection and for temporary relief of pain including any procedure requiring penetration of the skin, such as dialysis, vaccinations, venipuncture and other in-office procedures. 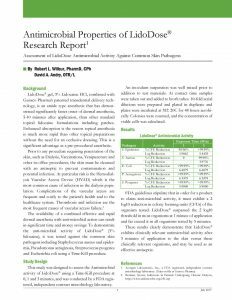 LidoDose® 25 Single Doses Per Box – NDC 35781-0301-5. Apply using a gloved hand. Swirl the applicator tip prior to removing swab from the pouch and apply to area 3-5 minutes prior to procedure not more than 4 times daily. For preparation of the skin prior to an injection and pain associated with any procedure requiring penetration of the skin, such as dialysis, vaccinations, venipuncture and other procedures. All Gensco products are distributed to pharmacy chains such as Walgreens®, CVS®, Walmart®, RiteAid®, Kroger® and Publix® through the major wholesalers such as McKesson, Cardinal and AmerisourceBergen. 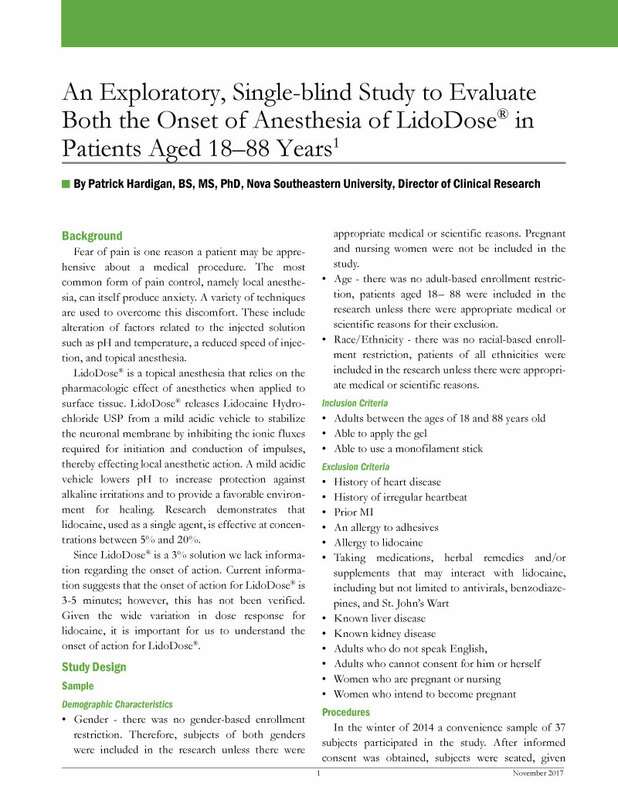 LidoDose® is contracted with DAPA (Contract #SP0200-15-H-0003) making it accessible to all military personnel and is also available to all MEDICARE patients (Medicare Contract #P1466). LidoDose® is available through these Group Purchasing Organizations (GPOs): Intalere, Innovatix, MedAssets, Premier, MHA, ROi and Vizient. To learn about the independent assessment of antimicrobial activity against common skin pathogens, click on the image below.